There are two important keys to making good mashed potatoes. One, you want to make sure the cooked potatoes are as dry as possible before you mash them. And two, make sure you don't overwhip the potatoes, or they will turn out gluey. In the classical culinary arts, the mark of good mashed potatoes is that they have a smooth and uniform consistency, with no lumps. In real life, however, a few lumps will give your mashed potatoes a rustic, handmade quality that is really wonderful. 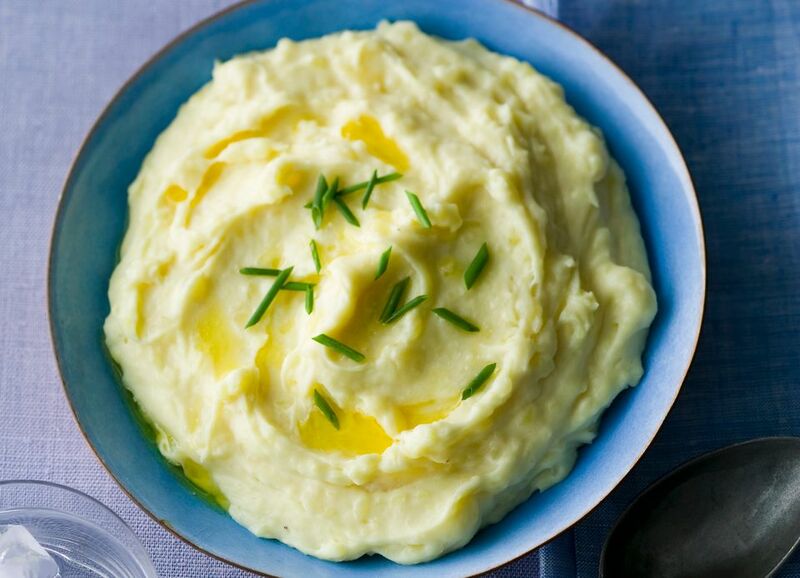 Also, classical mashed potatoes are always peeled, but ​leaving the peels on potatoes will add texture and color. It all depends on what you prefer. So while there are an infinite number of variations, the basic technique described below will help you make great mashed potatoes every time. But first, let's talk about what kind of potatoes to use. The best potatoes to use for making mashed potatoes are high-starch potatoes like Russet potatoes or medium-starch potatoes like Yukon Golds. These kinds of potatoes have the lowest moisture content, which is good because, as we mentioned before, we want the potatoes to be as dry as possible. So don't use red potatoes, white potatoes or any other kind of waxy potatoes for making mashed potatoes. Figure one good-sized potato per person. The steps that follow assume we are cooking four pounds of potatoes. Scrub and peel the potatoes, then cut them into quarters. Cutting the potatoes into uniform-sized pieces means they will cook evenly. Bring a pot of salted water to a boil. Just boil enough water to cover the potatoes. Boiling more water than this will only make it take longer to come to a boil. Also, take 3 ounces of butter out of the fridge and let it get soft at room temperature. Add the potatoes to the boiling water and simmer, uncovered until they are fork tender, which will take about 15 minutes, depending on how big the pieces are. While the potatoes are cooking, preheat your oven to 300F. Heat about half a cup of cream in a small saucepan, and keep it warm. In a separate saucepan, heat about a cup of whole milk. It's good to heat the milk and cream so that we don't cool down the potatoes too much. But note: You can make mashed potatoes using buttermilk and/or sour cream in place of the cream and milk. In this case, you don't want to heat either one. Just let them come to room temperature. When the potatoes are tender, drain them into a metal colander and shake off any excess water. Now, set the colander on a sheet pan or baking sheet and transfer it to the oven. Let the potatoes steam dry in the hot oven for 3 to 4 minutes. Add the softened butter and hot cream (or room temperature sour cream) and stir with a wooden spoon. Now stir in the hot milk (or room-temperature buttermilk) until the potatoes are moistened enough. You don't want them to be too stiff or too runny. Season to taste with Kosher salt and freshly ground white pepper. Finally, whisk by hand with a wire whisk for just a few seconds, until the mashed potatoes are fluffy. Don't overwhip. Serve right away. Attach the paddle attachment of your stand mixer and transfer the cooked potatoes to the bowl of the mixer. Mix on the lowest speed until most of the lumps are gone. Now remove the paddle attachment and attach the whip attachment. Whip for a few seconds until the potatoes are fully puréed. Don't overwhip! Add the butter, cream and milk as described above, mixing at the lowest speed until the mashed potatoes have the consistency you want. Then season to taste and give the potatoes one last quick whip, just to fluff them up. Serve right away.